APOEL Nicosia’s Champions’ League adventure looks almost certain to end this week when they complete their quarter-final tie against Real Madrid but Cypriot football remains high-flying in another sense. Cyprus has one of highest levels of attendance at domestic football in the world, when size of population is considered. An extensive new piece of research by Sportingintelligence, which has looked at attendance patterns around the world, has found the five most ‘dedicated’ football nations – by per cent of population who regularly attend games – are the Faroe Islands, Iceland, Cyprus, Scotland and England in that order. A staggering 10 per cent of the Faroe Islands go to games regularly, where regularly is defined as the home games of a particular club during the season. In Iceland the figure is 4.22 per cent, in Cyprus it is 4.03 per cent, in Scotland it is 3.68 per cent and in England it is 2.79 per cent. Only four other countries in the world have figures higher than 2 per cent: Norway, The Netherlands, Denmark and Belgium. Full details are in the table at the bottom of this piece. The methodology will be familiar to anyone who has read the Kuper-Szymanski book, Why England Lose (aka Soccernomics). Those authors performed a similar exercise a few years ago with a smaller number of countries. The total number of ‘match goers’ is essentially the total attendance for a fortnight’s games, or of every club playing once. This gives us a figure which is, by and large, the number of different individuals who watch games in that country. Naturally this method can tend to show ‘small’ nations having a huge passion for the game. But none the less, to get towards the top of the list football has to be important to a relatively large number of people in each nation. Equally, some very large countries feature high up, and half of the top 20 have 10m people or more, with Germany having almost 82m. Sportingintelligence has gathered attendance data from more than 100 countries (those where football is most widely followed and where data is available), using a range of sources including the European Football Statistics website, WorldFootball and Soccerway, as well as individual leagues and clubs. Different countries have different numbers of leagues or divisions: we used all those for which we could find reliable data. It is important to note that adding more leagues in any given nation, over and above what we have, would not make any significant difference to the total numbers. For example, one division is Cyprus counts for the vast majority of all match-goers there, just as five divisions do in England and Scotland, and six in Germany. The only country where a lot of leagues could be added if the data were available is Brazil. But even then Brazil, with its massive population, would not be close to the top. The data has been compiled over the past few months and is as recent as is available, mostly from the current season and no older than last year / last season in most cases. In terms of absolute numbers, England has the most different people attending games: 1,435,799 across the Premier League, three divisions of the Football League and the Conference. Next comes Germany (1.3m), Spain (714,000), Italy (630,000) and France (576,000) in that order. 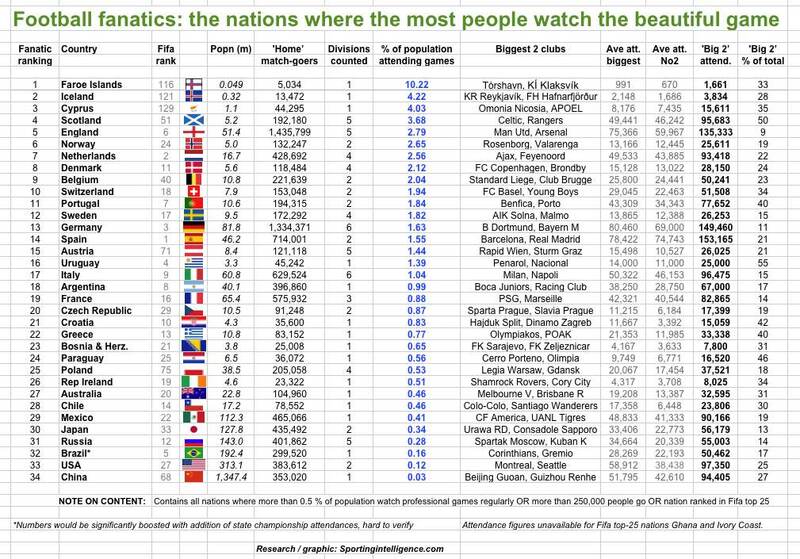 The nations in our graphic should include every country where 0.5 per cent of the population regularly go to matches, plus any nation where 250,000 or more people go (regardless of what % that is of the population) plus the figures from any other nation ranked inside Fifa’s top 25 best countries currently. In other words, the table should include all the most passionate nations, all those who are best at football and all those who sell hundreds of thousands of tickets per round of games in their leagues. If we’ve missed a country out that should be in, let us know. (NB: Must be football where people pay to watch, and therefore professional). The graphic lists the two biggest crowd-pullers in each nation – NB: currently – and their average home attendances, either current over the past few months or the most recently available figure. In the column ‘Big 2 attend’ you’ll see the combined figure for those clubs, and next to that the per cent of all fans in that country they represent. Look at Spain and see how Barcelona and Real Madrid account for 153,165 fans between them, or 21 per cent of the entire total in Spain. In England and Germany, however, the biggest two clubs (United & Arsenal / Dortmund & Bayern) together account for just nine and 11 per cent of the total attendance in those countries. As a rule, the smaller that ‘Big 2′ percentage, the wider and more diverse the football and footballing culture in that country. So England and Germany have wider and more diverse football cultures than Spain, dominated by their big two clubs. At the other extreme, note that in Uruguay the biggest two clubs account for 55 per cent of all attendances, while in Scotland, Rangers and Celtic combined account for 50 per cent. Big numbers like these will typically mean less diversity, less spreading of honours, and one or two massively dominant teams through history. (For more on how this works, see here).